Previously, on MinerBumping... Agent Skipper Huitzilopoch was minding his own business, ganking highsec miners. Out of nowhere, rebel Toran Saldera began agitating against the Code in local. Toran's anger intensified, and he threatened to wardec the New Order. Skipper Huitzilopoch > long live James 315! Sweet Susie > and long live all true supporters of the Code! Though warned that a wardec against CODEdot would be useless, Toran continued to boast of his power to declare wardec. Skipper Huitzilopoch > is it really going to happen then? Skipper was unafraid. Like all Agents of the New Order, he welcomed a fight. With the Code as his guide, he couldn't lose. If a wardec should come, it would only be another opportunity to add to the New Order's long list of victories. Toran was equally confident that his rebellion would succeed. Skipper Huitzilopoch > aren't you afraid of finest pvper in all highsec? Sweet Susie > He probably has powerful friends in Nullsec..
Toran understood there was little sense in wardeccing CODEdot itself, so he looked up the corp information of others in local. He identified a member of Systems Administration and Control corp. 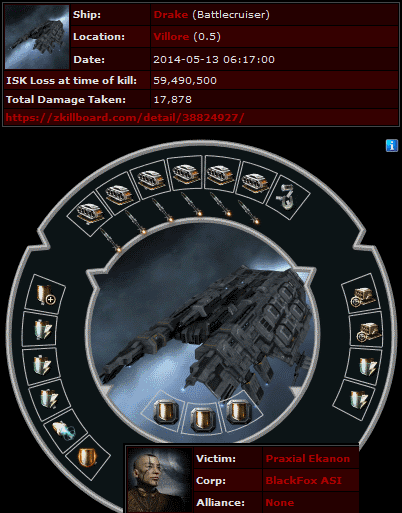 Believing Skipper's main was in that corp, he asked his CEO to wardec it. Toran was a member of BlackFox ASI, a corp which boasted of its intelligence-gathering capabilities. Toran succeeded in persuading his CEO, Ananiah Ben-Gurion, to wardec the corp that Toran had pinpointed as belonging to Skipper. There was only one problem: Toran had the wrong corp.
Ananiah Ben-Gurion > You guys really should fight us btw. Skipper Huitzilopoch > so why did you page me? Ananiah Ben-Gurion > Well, More along the lines of wondering why your hiding in the station. Ananiah Ben-Gurion > I thought you guys promised action! Ananiah Ben-Gurion > We want a fight. 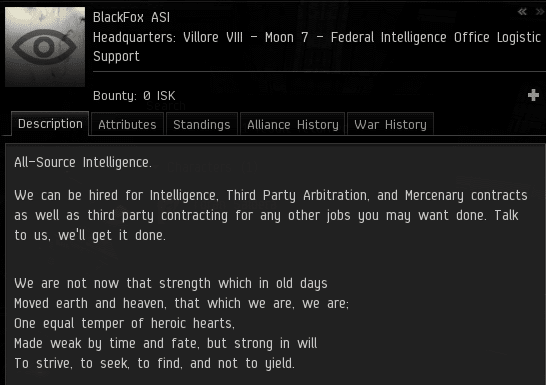 Once the wardec went live, the BlackFox ASI CEO urged Skipper to fight. He didn't realize Skipper's main wasn't in the corp he'd wardecced. 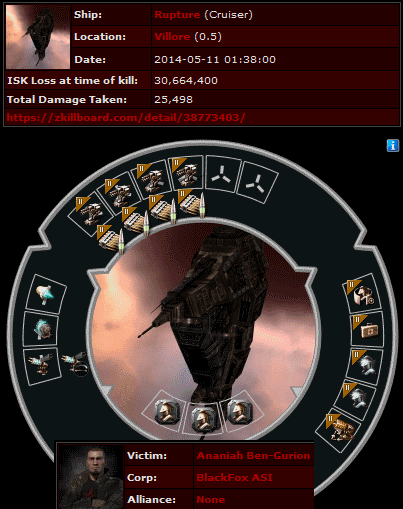 Skipper continued to use his CODEdot ganking character to destroy bot-aspirants in system. However, he understood and appreciated BlackFox ASI corp's desire to fight. As it happened, Systems Administration and Control was affiliated with the New Order after all. Skipper's main's corp joined the war as an ally. The BlackFox CEO got his wish sooner than expected. Skipper's actual main, Shnjago, suddenly appeared in system with a Proteus-class strategic cruiser and destroyed the CEO's Rupture. Ananiah vowed revenge. Meanwhile, Agent Skipper continued his Code-enforcement duties in the same system. 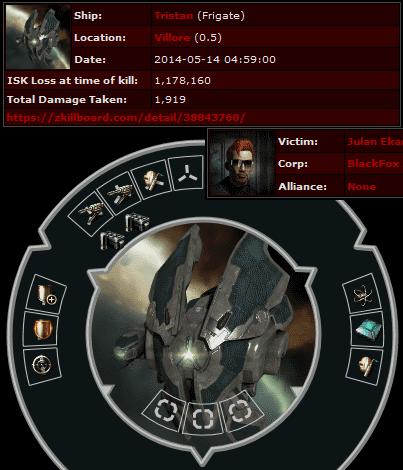 BlackFox ASI conceded they had no way to stop him from ganking miners. They demanded Skipper bring back his main so they could at least try to get some value from the wardec they'd started. When they least expected it, Skipper's main reappeared and blew up one of their corp's fail-fit Drakes. At this point, Skipper noticed BlackFox corp members had trouble escaping in their pods, despite being in highsec. BlackFox ASI had 35 members, and not all of them were aware of the war Toran Saldera had dragged them into. Skipper's main caught one of their anti-tanked industrials and popped it. Hoping to regain control of the system, BlackFox members fielded some combat ships, such as this Tornado. But they were no match for the New Order. Even one Agent was too much for them to handle. The corp became miserable. Even when they undocked in cheap little ships, they were promptly destroyed. What had Toran Saldera gotten them into? 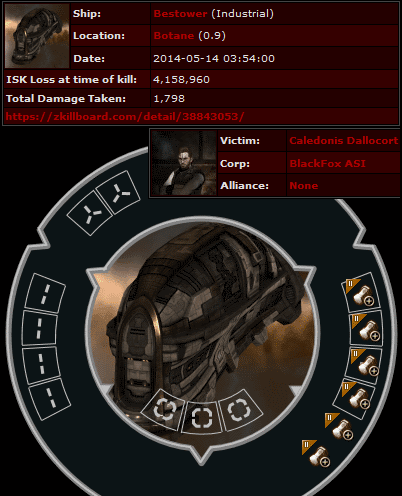 Unable to inflict even a single kill against their enemy, BlackFox ASI was humiliated. To make matters worse, the boastful Toran was nowhere to be found. He had promised to crush the New Order, but made no appearance on the battlefield. However, Skipper was determined to exact New Order justice upon the troublemaker, no matter how long it took. On top of it, he's dragged his (propably) innocent corpmates into it...shame upon him. All too often it's the rage of a single player that drags a corp down to it's demise. I haven't done hisec wardecs in years (many, many years), but when I did wardecs were usually precipitated by an unruly miner who flipped out in local along with his jetcan. The moment a threat of wardec was leveraged as a power play, I'd save them the time and ISK and drop a dec on them myself. I was back then, as I am now, not a very good PVP'er, and yet it always seemed to end badly for the other guys. The worst though was the CEOs. Far too many CEOs in EVE are incapable of any form of leadership. Of those who possess the charisma required to successfully lead, many lack even basic understanding of game mechanics. They would disappear without warning those they led, letting their underlings take the brunt of the losses. While my PVP was bad, I've always excelled at the meta, and I can't count the number of corps that fell apart simply because I talked to my war targets and pointed out, repeatedly, the failures of their leader(s). EVE needs more quality CEOs and fewer fly by night corps that close that the first sign of a wardec. But many people are driven by ego to want to lead, even if they lack the fundamental skillsets to do so. Oh well. Those CEOs, and their corps, make for entertaining stories here on minerbumping.com! Thanks for reminding us that only creative people like MinerBumpers learn from their mistakes; carebears grind mindlessly on, eyes fixed to the Isk. It happens because we have a goal which is not Isk-related, but is rather an ideal, a loftier aim, towards which we strive progressively. We can move quickly or slowly, or even pause in our development, with no loss. A poor CEO is a poor CEO, whether inside Eve or out of it. Most of us will have experienced working under a bad Manager at some time in our lives. It's irrelevant what the business of the organisation is, if the Manager can't manage *people*, he/she can't manage. End of. Bad Managers flock to Eve Online. Here, they can be as authoritarian as they wish, fleece corpmates of their Isk and see themselves addressed as CEO. It's a magnet for every inadequate wannabe with a casual interest in internet spaceships. And it is toxic for the game. It does, however, afford the awoxer an opportunity to exploit the failings of these people, to prick the balloon of their vanity. The Corporation concept has become so bloated with great features that it has lost any relation it may have had to the realworld entities it once probably sought to emulate. In Britain certainly, a corporation is a very large organisation; if you claimed to have a corporation (like mine) of 5 people, you'd be laughed out of the boardroom. I think it's probably the same in the US and elsewhere. So, the term itself seems wrong. Perhpas the requirements for forming a corp need to be looked at. I find it rich that some of us in the New Order have been villified for encouraging young players to open their eyes to the great feast that awaits them in Eve, while those same players can be abused in their first faultering steps by any jerk with some Isk and the Corpartion Skill in his limp sweaty hand. So, *so* well said. 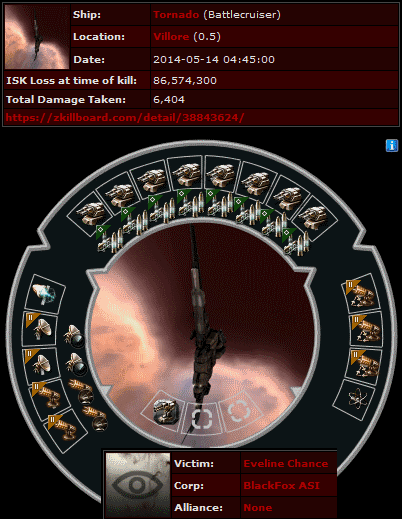 The very first corporation I wardec'd in EVE was back in mid to late 2007. It was a corp called Minmatar Miner's Worker's Party (sic) run by a dastardly fellow by the name of Os Kantar. He was fleecing his corp members of their ISK and time, promising an eventual move out to lowsec or nullsec, can't remember which, asking everyone in the corp to do their mining for free, give everything to the corp to use towards funding POS equipment and ships and whatnot, while telling me on the side how it was all a scam. I honestly didn't wardec him because he was scamming all these new players. I just figured that he'd have ISK piled away somewhere and I wanted my share of it. I wasn't even greedy about it. 100 million would have let his little scam continue on indefinitely, but he refused to pay up. It was over a year later than Os finally biomassed and left EVE, after a string of failed corporations, each in turn dec'd by my old corp, Stane's Raiders. The best part of it though is that most of the pilots in those failed corps went on to become *my* pilots in the first alliance I formed, went on to move out to w-space after Apocrypha, later out to losec. Many of those miners got involved in PVP, etc. While my goals were *always* rather selfish, I did manage to build something that lasted for several years and helped other players expand their horizons a bit. I've always been rather proud of that. I think the corporation system needs major work. Besides the obvious stuff, like the roles system which is a relic of a decade ago. Corporations are too cheap to form, as are alliances. Corporations need regular maintenance costs, and alliances need theirs increased quite a bit. Outside of these things though, I'm not sure how you could change the mechanics in a way they wouldn't interfere with the sandbox. While I agree there are far too many limp-wristed CEOs in the game, I think it should remain up to the players to prevent such CEOs from fleecing and misleading new players.